24 carat is Mephisto Genetics most Afghanica automatic, it was thier answer to an improved Autoflower SOG strain. They used a selected cut of BOG?s Sour boggle (Sour Bubble x Bogglegum Monster Pheno) and began selectively breeding to achieve an excellent Automatic variety of connoisseur quality. She is a heavy hitter, that produces EXTREMELY dense buds, fan leaves can grow to the size of dinner plates, smaller fan leaves and stems that are coated with thick resin. She exhibits pink and purple phenotypes so is beautiful as well as potent. She grows 50-70cm tall as a little bush if given the space (you can also pack these tightly together for an amazingly productive sea-of green) She is stout with a thick stem, branches and tight internodes, because of this she has a very high bud to plant ratio. She is a real stinker, so be careful and always use a Carbon Filter. 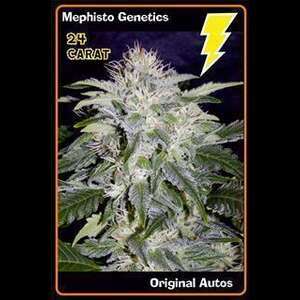 She is also Mephisto Genetics most medicinal strain, helpful for sleep and aches and pains, and appetite stimulation. 24 carat was tested by alpha-cat (www.alpha-cat.org) and the result was 15% thc. Expect at least 50g of dense frosty goodness when treated well.